Like many people who have been working pretty much constantly from college graduation until, say, their 34th birthday, I think a lot about taking time off from work. A few months off would do a world of good. Since deciding to go back to school this coming January, I've been facing the prospect of two years of full-time work plus part-time school by retreating into these fantasies with ever greater frequency and fervor. Three to six months on the coast of Maine, far up north by the Canadian border, sounds about right. I can picture the cottage, the fires in the fireplace, the walks by the cliffs, the lobsters from the boats. I picture stuffing my car with the necessities - my howling Siamese cats, a few heavy sweaters, my painting supplies, some good novels, and every piece of cooking equipment in my kitchen. Because, damnit, if I ever get several months off in a row, I'm going to do some serious cooking. Now, here's the question. What cookbooks do I bring? Because if I could only bring one book, this would be my choice. A fantastic book on how to make jams, chutneys, pickles, vinegar, cordials and other good things. Almost everything I've ever made from this book - Rum/Brown Sugar/Peach Jam, Apricot Jam, Welsh Rabbit Spread, Dried Cherry Cordial, Blueberry Relish and many, many more - has been great, with one exception. The Tarragon-Pickled Flame Grapes were disgusting. I don't know why I thought they would be better than they sounded, but they weren't. But if I had the leisure, I would jelly and pickle my way straight through the year. I love this cookbook with a deep and abiding passion. The subtitle is misleading. Really, it should be called The Russian and Former Soviet Cookbook. The range is wide, but this is the sort of cooking that shows that the cold countries have something going on culinarily, too. Sauerkraut, horseradish, pomegranates, walnut sauces, wild mushrooms, game and sour cream all play big roles, and that's good by me. Because after all the French and Russian food, I'm going to need some salad, and this book (by local wonder-boy Chris Schlesinger) makes salad interesting. The recipes in this cookbook are long and involved and I rarely have time for them. But when I have my several-months-off-in-a-row, I'll have the time to spend three or four days just preparing the filling for ravioli. I don't actually own this book, but I'll buy it for my fantasy-time-off. I've done some sourdough baking, but I've never really mastered it. This is supposed to be the book-of-books for sourdough. As a reference for basic stuff. Nick's recipes are solid. I couldn't go three months without a good jambalaya. I have a lot of cookbooks from the early 1900s. I've cooked a few things from them, but generally I just peruse them for pleasure. I love to see the way that everyday cooking has changed. These cookbooks will have 200 recipes for main-dish egg dishes and only two that call for chicken breasts, which seems much more sensible than the standard current ratio. The pickling and preserving sections are generally quite large, while today's cookbooks rarely include anything on the subject. There are also all sort of strange and intriguing recipes, like the Chocolate-Dipped Potato Candies (made from mashed potato and powdered sugar) that seemed to have been the rage for a few years. I would love to bring one of these cookbooks with me and actually try out the recipes. I've been intending to post about my evening pressing grapes, but honestly I've had a hard time figuring out what to say. I don't know much about the wine-making process. Probably anyone who stayed even a little sober through a vineyard tour would know far more than I do, even though I asked all sorts of questions at my grape-pressing evening. Perhaps if I hadn't been doing so much tasting - of the newly fermented juice or of last year's grappa - I would remember some of the answers better. But I'll try to list my somewhat incoherent impressions. 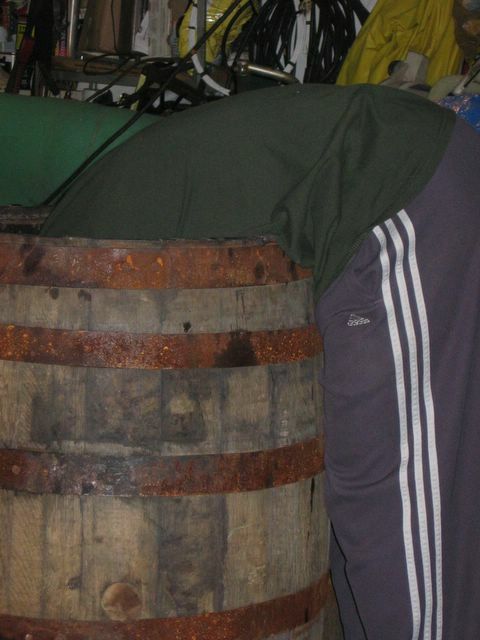 1) If you can marry your way into a nice Italian-American family, with a gentlemanly patriarch and three strapping sons who together make four barrels of wine each year in the garage and converted-basement-wine-cellar, do so. It's worked out very well for my friend. If you are unable to get married at the moment, get a friend make the match. You will get invited to press grapes, which will make you feel ubercool. And you will be given wine. 2) To make wine in New England, first you order grapes from California, though you can supplement with some local Concords. You break up the grapes a bit in a scary-looking machine that would surely take your fingers right off. That's called the crushing (not of your fingers, of the grapes). 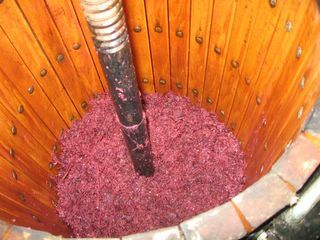 Then the grapes sit around in a barrel and ferment for a week or two before you press the grapes and put fermented juice in beautiful huge bottles called carboys with special seals on the top that let gas out. That's the pressing. And that's what I got to help with. And I don't know much about the process after that point, except that there's no filtering, but lots of decanting, and then some aging, and then presumably bottling, or maybe the bottling first, then the aging, and finally the drinking, at which point I'm on solid ground again. 3) Instead of rowing machines, there should be pressing machines. Same motion, more fun. 4) At the pressing stage, the wine is already, well, wine, of a sort. But the character of wine at this stage (I'm sure there's a real name for it; I'll just called it wine-in-process) is to finished wine what a jug of cider left to ferment on your porch is to an aged cider in a bottle. This stuff is fruity, a little fizzy, a little harsh, somewhere between fruit juice and wine. Which is what it is, of course. It's also pretty tasty, though my friend's three-year-old son, already a bit of a connoisseur, disagreed. He kept tasting and saying, "Not done yet!" 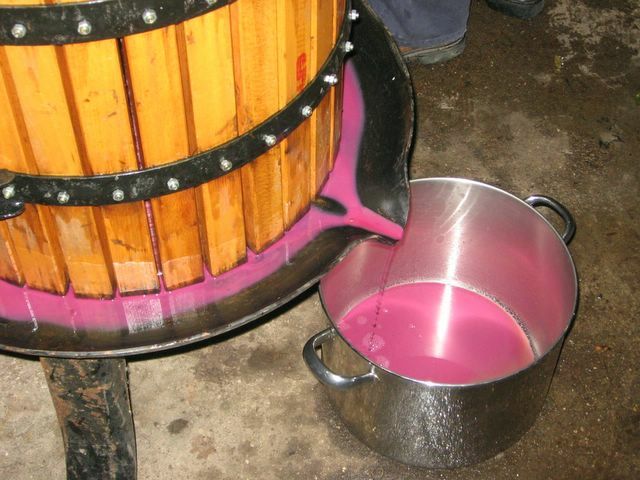 5) Pressing grapes will make you feel all connected to ancient rhythms of the seasons and all that good stuff EVEN if you're doing it in a garage. 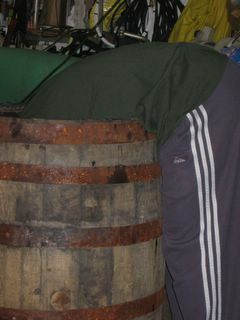 It's not easy to get the last grapes out from the bottom of the barrel. The grapes waiting to be pressed. The results of the pressing. Looks like melted black raspberry ice cream, doesn't it? By the way, if this wine is as good as the stuff they made in 2003, it will be very good wine indeed. I am endlessly impressed. Sugar Mtn Farm: It is probably my father's influence that got me interested in organic gardening - certainly what got me interested in gardening. It started with helping him in his vegetable garden. We raised pigs with some cousins when I was a child and another cousin has Highland cattle on a mountain farm over in New Hampshire. I always loved visiting Stoddard and seeing the Highland cattle. I wanted to have a place like that eventually. I figured out very early on that starting in farming did not look like a way to end up farming. To get started requires capital to buy land, livestock, etc. I read about, and saw, a lot of people who burned out that way. So instead I worked at earning the money that it would take to buy the land and get going. I invented some things in high tech, did programming and computer consulting early on, published a magazine in the computer industry, founded and ran a manufacturing company and then gradually backed my way into the farming. someday more of my time would be spent on the land. Not just for myself but for my children. Along the way I found a wonderful young lady named Holly who had similar dreams and together we've been making them happen. SC: Do you come from a farming background? inputs, healthier, environmentally friendly, healthier, less dependence on the commercial industrial complex, healthier, better for the soil life, oh, and did I mention healthier? Seriously though, I strongly believe that organic methods are better for the health of the soil, the health of the plants, the health of the animals, the health of the farmer and the health of the consumer. What has become the "modern traditional farming", a.k.a. big farming, is unsustainable over the long haul, is dependent on non-renewable inputs, costs more in the long run and destroy the farm itself by destroying the soil and creating mountains of debt. It is important to realize that one must go beyond organic farming to achieve sustainability. Merely being organic is not good enough. You can do organic farming, even "certified organic" but still be feeding your livestock corn and soy without giving them natural free access to pasture, without improving the conditions of the soil, without having a long-term sustainable operation. Merely organic is not good enough. SMF: It's easy to do. Our location is ideally suited to pasturing animals. We do not have a lot of tillable soil here on the mountains. Around our house we have what used to be sheep pastures long ago. They were even hayed for nearly a century by the man from whom we bought our land. It is amazing because the hills are quite steep - we are on the side of a mountain. Safety is an issue. Grazing animals on the pasture is safer than haying these fields - pigs and sheep don't tend to roll over and down the hill like a tractor. By pasturing the animals they are gradually reclearing the old fields. It is amazing to let them into an area of dense brush and then next year see that same space growing lush grasses, clovers and other pasture plants. The fields feed the livestock and the livestock feeds the fields. This also saves me from bush hogging or mowing - a noisy, smelly process I do not enjoy in the least. sheep, cattle, chickens, etc. Lock them up in stalls and they stink. Put them out on pasture and they smell fine and are a lot healthier. The same would be for you or I. Pasturing is a lot more pleasant and healthier than indoor confinement or even pens. differs from, not just factory farms, but larger, officially organic operations? grow quite as fast as pigs that are given supplemental feeds such as the milk and cheese we also feed our pigs. The pasture/hay pigs did get a very small amount of bread (about 0.5 to 1 lb) each day or two for training purposes but that was not a significant level for a several hundred pound animal. SC: Training? You train your pigs? train. Call them and then when they come give them a treat. Any time you feed them, call them. They pickup on it pretty quickly. Even chickens can be trained. When it comes time to load the pigs to take them to market the simplest way to do it is to train them to load themselves. This is a lot less stressful for them, and us. Since they aren't stressed they don't release adrenaline and other chemicals in their bloodstream that would hurt the quality of the meat. This results in better pork. several thousand pigs a year. I don't anticipate doing that. It is more a matter of how much time we want to spend doing it. With a very large herd we would no longer know the individual animals. I know our boar, every one of our sows and most of the growers pigs individually. They all know us as well. In addition to the pigs we also have sheep, chickens, ducks, guineas, livestock guardian dogs and children to raise. We also want time for gardens, construction projects and enjoying life. If we were to follow the "Get Big or Get Out" paradigm that seems so prevalent then we would lose ourselves. If I wanted to be stressed out I would still be managing employees and working at a desk. To keep this familiarity and fun I don't expect to have more than 200 pigs on farm at any time, probably fewer. By far, the largest group will be piglets or weaners. The number of sows will likely be no more than 30, one or two boars and about 60 growers. This means an annual production of about 120 whole pigs plus about 450 piglets. directly to consumers who want whole, half or quarter pigs. We also offer a subscription pig which is one quarter plus eggs every three months. Frankly, the wholesale market pays poorly. We make more money selling directly to the retail customers and our customers save more money buying directly from us - as well as getting superior pork. Perhaps one of the important things about buying local and from the farm is eliminating the middle man and the expenses associated with that whole system. SC: Your website indicates you raise Yorkshire White pigs? SMF:Yes. Ours are the classic heritage Yorkshire Large White pig that originated in York, England around 1769. They are known for their large meaty frame, durability, mothering ability and doing well on pasture. Ours are not registered purebreds. Based on the fact that we get the occasional spotted piglet I know there is a little something extra in their genetics, some other breed. This is good because a little cross-breeding makes for a healthier more robust animal, bigger weaned litters and faster growth naturally. From each generation we select the very best gilts to raise to become sows and the very best boars to become breeding boars that we trade out with other pig farmers. In this way we can continue to improve the herd over the years. boars, sows, gilts. I've heard of barrows and weaners too. What exactly are each of these? point they are already on a diet of solid foods. On pasture the piglets start munching the grass fairly quickly even though they are getting most of their nutrition from the sow. Weaners become growers, at exactly what age is a big vague but figure on two months or about 50 lbs. Gilts are the young females who have not yet farrowed a litter of piglets. Farrowing is the act of giving birth. A sow is what a gilt becomes after she has had her first litter - that is to say an adult female pig. Boars are intact male pig - that is to say they have not been castrated, or in less delicate terms, they've not had their balls cut off. Another word for castration is cutting. Barrows are castrated male pigs. SC: Why do barrows get castrated? have a bad smell to it, like urine, called "boar taint". There has been some very interesting research done on this down in Brazil. They identified the chemicals produced by the boar and when it became a problem. One issue seems to be that some boars produce more of the chemicals that make the bad smell in the meat. Another issue is that older boars produce more of it. Lastly, boars exposed to females male produce more of the chemicals. So an alternative to castration would be to slaughter the boars young enough and don't expose them to females. Also, this may be able to be resolved through selective breeding. farmer we have borrowed boars from says the trick is to put the boar out by himself away from the females for a month and then the meat tastes fine. He has eaten boars that were several years old and over 1,000 lbs. I think Archie knows what he is talking about. There is a good reason not to cut the boars. On average, boars grow about 20% faster than gilts and about 10% faster than barrows. The boars also put on more muscle and less fat making for a leaner meat. It is less expensive to raise the boars to market weight than it is to raise barrows or gilts. Most people who buy male piglets for raising to butcher want them cut because of this fear of the meat tasting bad. I can understand the fear, it is a big investment and you don't know if it worked until the pork is in your mouth. Castrating the boars is a known way of making sure they don't have boar taint. I don't like doing the castrating but half the pigs are male and very few of them will ever become breeders so most of them end up getting cut. It will take a lot of testing and education to get people to want to leave the boars intact. I doubt that it is going to change any time soon. SC: Why did you choose this breed? SMF: There are a number of reasons why we have Yorkshire pigs. 6. Consumers favor a white pig. I'm not sure why. Cuteness? 5. These pigs have long hair and thrive in our harsh winters. 4. Yorkshires have large muscles and a lean body so they aren't fatty. 3. Yorkshires are good mothers which produce superior litters. 2. Yorkshires are known for pasturing well. 1. Yorkshires are readily available around our area. first four sows which we got as piglets from a farmstead just over the mountain from us. Add to that some good luck! SC: How important do you think breed is to meat quality? Somewhat, but it isn't so much a specific breed as specific genes. Lots of people will tell you what their favorite breed is. However there are several genetic traits that can compromise the quality of the pork. Farmers and researchers are working to identify these genes and breed them out of the herds. In this respect we appear to have gotten lucky since we don't have any of the problem. I didn't know about this when we started! Interestingly, one of the important things that have come out of this type of research is that stress is a major trigger for the problem genetics which then causes the meat quality to deteriorate. Pigs raised on pasture, humanely managed have much less stress than those raised in confinement operations. Thus pasturing appears to provide better quality meat for one more reason by simply reducing the stress. sustainably-raised pork is worth the extra cost? fed hormones, antibiotics or exposed to pesticides and herbicides. 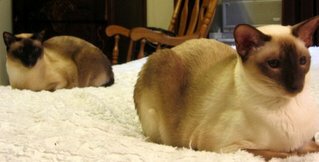 are a lot of other great free resources on the web about raising small numbers of animals. more that way and the consumer gets a better price by cutting out the middlemen and extra costs like transportation and storage that would be incurred with wholesale markets. Our primary means of reaching new customers is our web site, being listed in directories, word of mouth and posters on community bulletin boards. We offer both piglets and full grown market pastured pigs as whole pigs, half pigs and quarter pigs delivered to the butcher. People who want to do it themselves can buy their piglets from us. Buying from us has the advantage of getting quality piglets rather than culls from the big breeding operations. We don't sell our culls since it is easy and inexpensive for us to raise them ourselves on our pastures and that way our piglet customers know they're getting good quality animals. be the same as todays with a chance of something different. food regularly. The continued globalization pressure will produce a bit of lash back in the form of strengthening the Buy Local movement which keeps resources and money in the local community. So... now come back in 20 years and we'll see if I was too far off in this limited prediction! growth in awareness of the issues related to sustainability and the movement is continuing to bloom. If anything it is accelerating. A lot of it is controlled by how much disposable income people have. Better quality things tend to cost more, especially when they are produced more locally in lower volumes. If people have the money they tend to be more willing to support organic and sustainable food production on a local level. If the economy tanks I would expect this market to suffer to a degree. It is critical for farmers to control their debt and expenses carefully so they can weather the dips in the economy. But, that is true for everyone. customers in organic, locally-grown meat, as compared to the roadside stand mainstays of apples, u-pick strawberries and corn? there is a time delay with the meat while a roadside stand can be more of an impulse buy. SC: I'm envying you your Vermont farm this week particularly. You could miss fall altogether in Boston. was very slow getting started and the colors were muted but then on Thursday of last week and Monday and Tuesday of this week we had some good weather and nice colors. Not as brilliant as two years ago but satisfying. The remarkable thing is we still have not gotten a frost. It is now a month and a half past when I expected to get the first frost and our cucumbers, beans, tomatoes and pumpkin's are still growing. Perhaps this is a side benefit of global warming?!? Seasonal Cook. I hope that you have a great fall. SMF: Thank you for having me. I've enjoyed this conversation. There's been a lot of discussion over on chowhound lately about the cost of sustainably-grown, organic, local food. I thought I would share this picture from a few weeks ago, when some friends of mine took me for a much-needed day in the country. We stopped at a farm stand, and I bought these beautiful Rose Finn fingerling potatoes. They had a pretty pink blush when raw, which unfortunately went away with cooking. But they were delicious nonetheless - very tender and moist, with a delicate skin and a strong potato flavor. Most supermarket potatoes don't taste like anything at all. 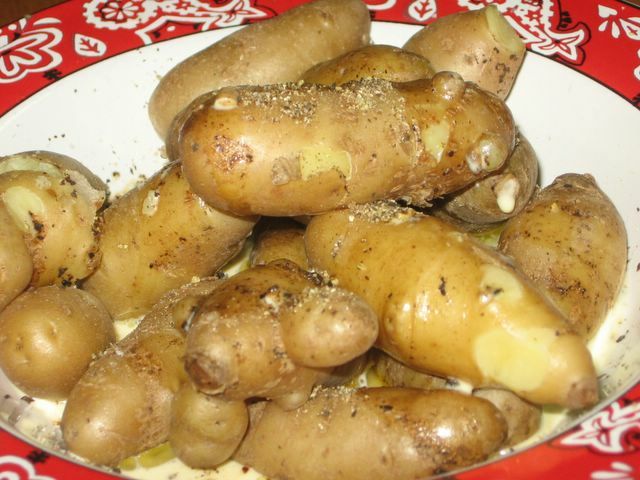 I ate this bowl for dinner one night, because I've got Irish blood in me and I don't think there's anything strange about potatoes for dinner. Sure, potatoes alone might be a little, well, carb-o-rific, but it's a fallacy to believe every meal needs to be well-balanced. Your diet needs to be well-balanced, overall, but each individual meal need not be. I think that the well-balanced meal trap can be a cause of overeating among people who generally eat fairly healthfully. I can find myself cooking an orange vegetable for dinner even though I've already fixed a green vegetable, meat, starch and a mixed salad. Though an orange vegetable is generally a good thing in and of itself, in total I just end up with too much food. So, back to the potatoes. Not well-balanced, admittedly. But full of vitamins and fiber, and - when touched with a little butter, a little milk and some black pepper - delicious. I consume potatoes like this by mashing each one with a fork just once, then taking a bite. Smush, eat, smush, eat. It's extremely comforting to eat like this, and the result is something somewhere between mashed potatoes and plain boiled. Since this meal consists almost entirely of potatoes, they have to be top-notch. Mediocre spuds will leave me yearning for something more. These top-notch potatoes cost $2.00/pound, which is a good bit more than double the supermarket price. Of course, I don't think I ate a whole pound for dinner. Maybe $1.25 worth? Add a few cents for butter and milk (organic, both) and a 75 cent organic apple for dessert and at the most my entirely pleasurable and nutritious weeknight dinner was $2.25. I wonder if the organic-and-local-costs-too-much crowd could say the same? I should have put this one up in the first batch. My best friend/housemate from college is now chef-owner of a wonderful family restaurant in Brattleboro, VT. The menu is simple and all-American - hamburgers, fish and chips, chicken-under-a-brick, and the type of Italian dishes that have entered the American mainstream. What makes his restaurant exceptional is his commitment to local foods; on the Riverview Cafe site, you can see a listing of their local providers of produce, free-range chicken, maple syrup, smoked meats, and cheeses. The quality of the ingredients makes the familiar food wonderful. I also like the transparency. Although it has become common to describe the origin of ingredients on high-end restaurant menus, it is still extremely rare for affordable family restaurants to do this. Also, the Riverview looks out, as its name implies, over the Connecticut River across to lovely wooded hills. In the summer, you can sit outside on the roofdeck. I recommend highly that you do. Fish I've tried, but not yet learned to like: trout, bluefish. Of course, as a New Englander, I love shellfish. Mussels, oysters, crab, lobster, scallops: all good. So it's not usually the fishy flavor that's a problem; it's that fishy texture. Anyway, her blog has a great breakdown on the different qualities of different types of fish and how to substitute one for another and all sorts of other good stuff. Personally, I think she really just needs to post a list of "icky-textured fish," but I suppose a reasonable person might argue that ickiness is personal. Julie Powell, of the wonderful Julia/Julie blog, wrote an piece for the Times a while back essentially complaining that the organic/heirloom-obsessed foodies of today fetishize ingredients. Followers of Alice Waters, we place a premium on "simplicity," showcasing our fabulous tomatoes with just a sprinkle of overpriced sea salt, turning cooking into shopping. And, hell, she does have a point. I think it is important to remember that a bag of Goya lentils, 79 cents at any supermarket, will make a great meal, and paying $20 a pound for salt is ridiculous. And there's nothing inherently superior about simple food compared to complex. The tendency to assume the simpler is better and purer comes from deep in the American Protestant psyche. Shaker barns are beautiful, but neither more beautiful nor more moral than a Gothic cathedral, and I would say the same applies to food. A simple poached pear is not better than a Napoleon, and a salad of mixed greens is not better than a curry. There are just different. And it is true that less-than-wonderful ingredients can be used more effectively in more complicated cooking, which means it's worth learning how to cook well if you want to eat delicious food without paying bundles. But (and y'all knew that "but" was coming, didn't you? ), the basic ingredients of an American supermarket are crap. Really. Particularly the meat and vegetables and dairy. (You can do okay on some staples like pasta and vinegar and so on.) And Julie's beloved Julia Child, who was no food snob, knew this. That's why you can watch her swoon in the markets of Provence in the old episodes of the French Chef that have just come out in DVD. So here's my story about good ingredients, bad ingredients, and the ability of one to save the other. Last Sunday was raining and dreary and miserable in Boston. I had spent the day before with my boyfriend at the Lowell Celebrates Kerouac festival, which involved a lot of walking from one place to another in the rain and getting drenched. So Sunday I just wanted to stay inside and warm, with something cooking slow and low. I decided that the ideal comfort food for the day would be pasta with a red sauce, but I was out of canned tomatoes. I couldn't bear the rainy trip to the supermarket, but there's a packie down the corner, and I ran down to buy a can of tomatoes. 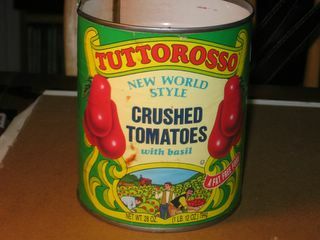 I was pleased that there were two choices of crushed tomatoes available, Hunt's and another brand with an Italian-looking label. I bought the Italian-looking one. I didn't read the label. Back home, I started my sauce by slowly cooking some onions. Then I cut the meat off the shank I had thawed and diced the pieces. Browned the meat, added the onions back to the pot, added the nice marrowy bone from the shank, and then opened the can of tomatoes. Well, I was stuck. I poured in the tomato sauce, then added some beef stock. But I knew there was no way I was going to continue with my plan for the sauce, which was to just add a bit of cream after the long cooking. That would make the flavor far too dependent on the tomatoes, tomatoes that are probably usually used to make school lunch pizza. So I started adding stuff. A bunch of fennel, chopped and quickly sauteed in another pan. A little carrot juice. A handful of wild dried mushrooms, re-hydrated and chopped. A bit of tomato paste. A goodly dose of good olive oil. Then I just let it cook for a long time. It was delicious. Really, very good. 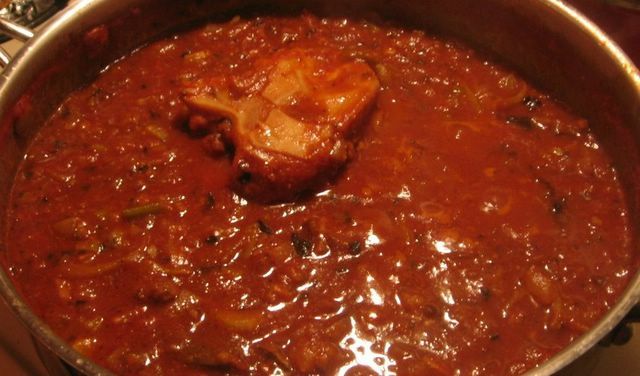 It was a great sauce, with low acidity, great depth and richness, meaty but with some high notes from the fennel. 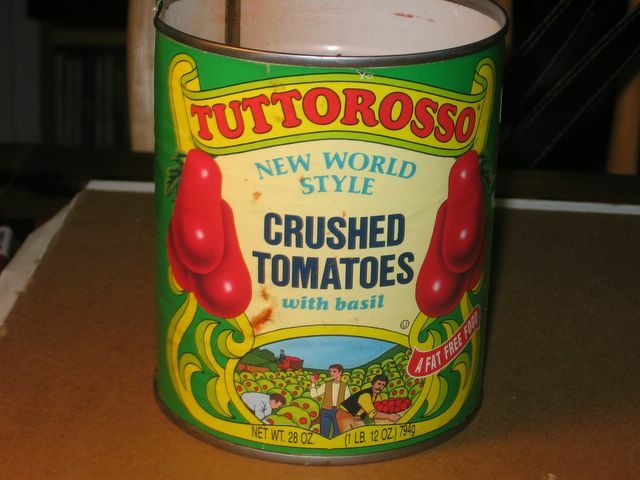 Now, Julie would say that this proves her point, a good meal can be made from terrible tomatoes-from-concentrate. And she would be right. But I would also say that this proves that having on hand homemade beef stock, grass-fed organic beef, dried wild mushrooms, very fresh organic fennel and good quality tomato paste and olive oil will allow you to flub one ingredient - because the quality of the rest of the ingredients will raise the quality of the meal. Hey! These noodles are stale! AP: Scientist Discover Ancient Noodles! See the list of links? On the side of the page? I didn't, until about two weeks ago, at which point I couldn't figure out how to change them, because I can sometimes be a moron. Now I've figured it all out, and I've added a few links. The link to Chowhound, my foodie online home, is a no-brainer. Chocolate and Zucchini hardly needs more publicity from me, but I read it and like it, so here it is. Haverchuk is written by Chowhound's mzn, who shares a lot of my food-related interests. Bitter Greens takes on the world of agri-business and champions small farmers. And I've just added Sugar Mountain Farm, a small farmer who posted a nice comment here about my pork article. It turns out he pastures pigs in Vermont and has an interesting blog about the farming life. I've also linked to Mamashoe, which is the amazing farm where I bought my organic, pastured pork. Oh, and my apologies for not posting much lately. My job has been taking up a lot of time, and then I got really sick for a few days. Maybe tomorrow I'll post on the food choices available at my local packie, which was the closest purveyor of food I could drag myself to when just standing up was problematic. Thank god for Haagen Daz.